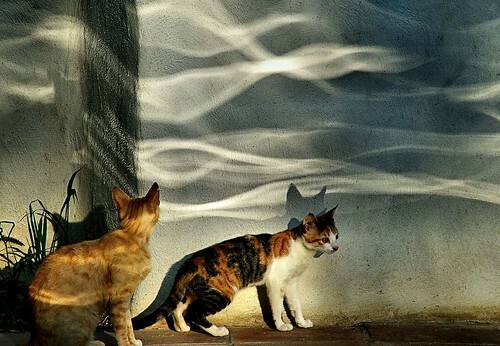 Cats and ripples, originally uploaded by ccgd. I know - a cat photo. There has to be a first time for everything, and this is me posting a photo of cats. Sad but there is a neat contrast between these two Iberian cats, and the sun reflecting off the swimming pool in our holiday house. Ruth in Madrid, originally uploaded by ccgd. I’m writing this, just after lunch, on another baking hot day, in our small holiday house just outside Orgiva south of the Sierra Nevada. Ruth and I are on holiday ourselves, without sons. Spooky but fun. We flew to Madrid last Thursday, had a couple of nights there, and have been in the Alpujrras since then, but head north to Granada and Toledo next week. Our hotel in Granada has wi-fi (part of the reason I chose it – sad eh) so I should be able to post this blog entry, check Flickr and answer some e-mails. Is strange how on-line life does change the way you live in real time, although I must admit I have not missed internet access at all over the past week. Madrid was fun, seriously fun. Ruth and I were able to do all the Spanish city things that tend not to be possible with sons (or daughters I suspect). Eat late at good restaurants, have boozy lunches at street cafes, drink cava and eat tapas in that magical hour between 8 and 9. And visit great art galleries, spending serious amount of time looking at fantastic art from the 10th to the 19th centuries. The Prado was outstanding, with a great Goya collection, some quite weird painting from Hieronymous Bosch, and an unforgetable wonderful collection of early Visigoth (10th century) paintings. I was quite blown away by them, as their resemblance to Pictish art warrants further serious study. As some of you know I tend to travel a fair bit with work, so many of these city type activities are not unfamiliar to me, but visiting nice restaurants and cool cities with colleagues (or just yourself) is quite different from doing so with a loved one. For one thing when you are there through work, days tend to long and busy, and when you do get to do something fun you tend to enjoy it, but spend most of the time thinking that it would be so nice if Ruth could be here as well. Well she is and it’s a lot more fun with her than any number of pals from work (sorry guys but you know what I mean….). Well we have had our week chilling in the sun (that may not sound right, but…) in the Alpujarras, a mountainous region between Granada and the sea, bounded to the North and South by seriously high peaks, and popular with hikers, bikers, and Hippies. British Hippies. It’s a bit like Scoraig (the crofting peninsula south of Ullapool re-colonised by people with alternative lifestyles in the 60’s and 70’s) but with a lot more sun. I always wondered what happened to all those people who were about 5-10 years older than me in the 70’s who did not get into punk, or get their hair cut and drift into Thatcherism and morgages in the 80’s. Now I know – they all live around Orgiva, running little ecologically sound tourist businesses, whole food stores and the sort of alternative book shops last seen in the UK in 1979. We are talking more ancient UK registered vans than you would see at Glastonbury, seriously long hair (often grey and bald on top) very brown legs and sandals. In fact more sandals than you may ever want to see again in your whole life. Apparently its been a drop out location for people from all over Europe for 40 years or so, but was made famous – and mainstream – by Chris Stewart’s whimsical “Good life abroad” books. Harr under the Kessock Bridge, originally uploaded by ccgd. 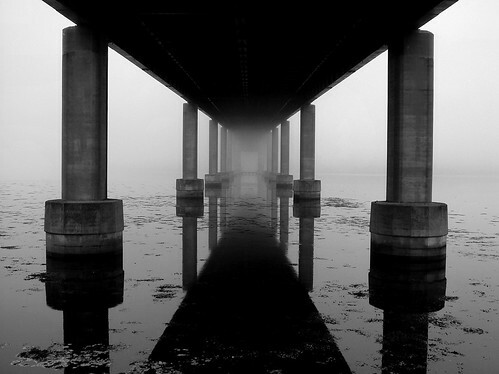 A very early mist under the Kessock Bridge in Inverness. Looking North from the Gaelic chapel, originally uploaded by ccgd. A late evening shot, looking North from the Strupie Lane. Spectacular colours. Alba gu br'ath, originally uploaded by ccgd. 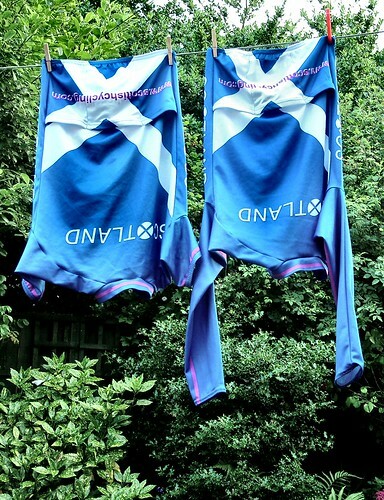 Magnus's Team Scotland Cycling tops on the washing line. Fraser, originally uploaded by ccgd. My friend and neighbour Fraser, as we walked along Cromarty Beach last night. I think I'm getting better at People shots. 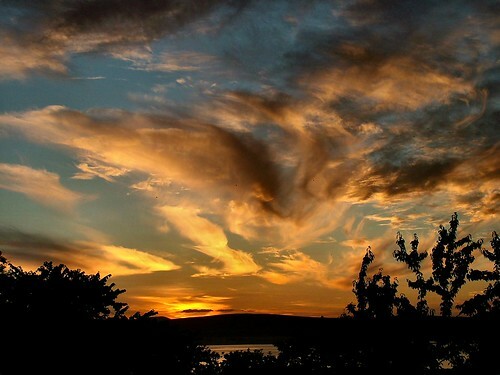 A sun and cloud vortex, originally uploaded by ccgd. 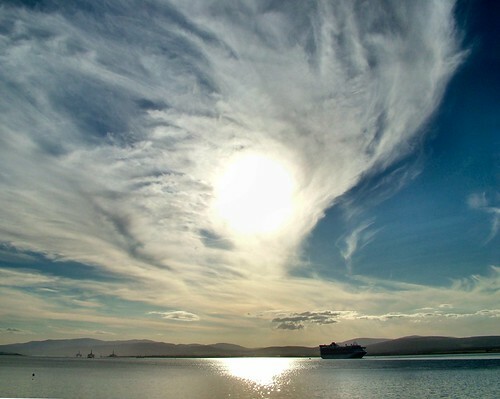 The MV Golden Princess (100,000 tonnes and 2,500 passengers) leaves the Cromarty Firth on a perfect July evening. The Golden Princess, originally uploaded by ccgd. 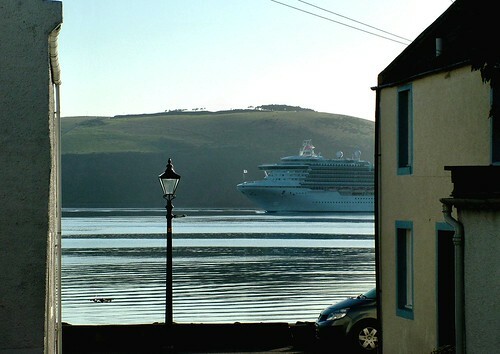 Golden Princess (108,865 tonnes), with 2500 passengers, is glimpsed frpm Little Vennel, Cromarty, as it enters the Firth at 7:00 on a sunny July morning. Restoration Film Crew, originally uploaded by ccgd. The BBC TV series Restoration is featuring the Cromarty East Kirk in this years series. 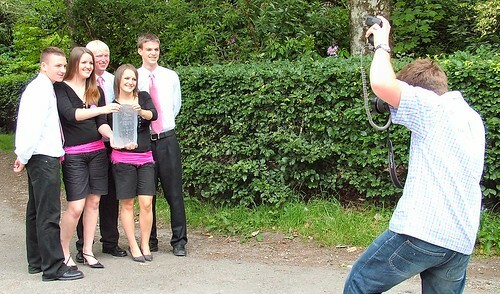 I snapped the crew - including presenter Griff Rhys Jones - as they walked past our house, back in early May. 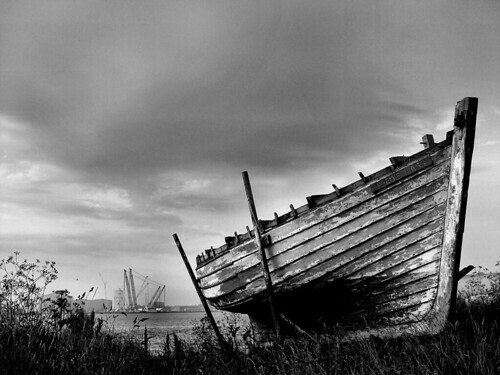 Posted it on Flickr, and on the Cromarty Image Library. Then came a very polite note from the production company asking for it to be removed, as it would pre-empt this years marketing campaign for the Restoration programme. Quick question to the Beed, the production team, and a large part of the UK population. Which part of "Cromarty is not a Village , its a Town" do you not understand!!!!! "One final point - and perhaps a pedantic one (grin) but Cromarty - where I live - is a town not a village. I'll agree it's a very small town - only 600 souls in the town and 800 in the Parish, but has been a town for 1000 years, and a burgh for the past 800. 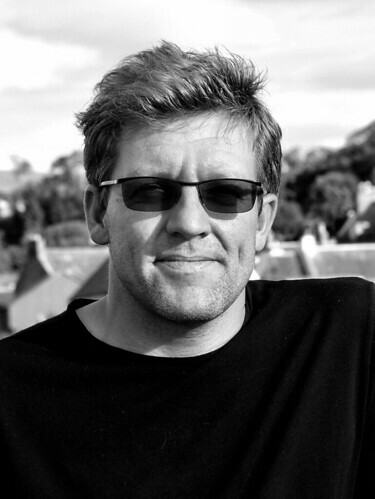 In fact I can trace one branch of my family tree directly back to a John Urquhart who left Cromarty in 1410 to buy a farm in Orkney, when Cromarty was the second biggest town in the Highlands after Inverness. 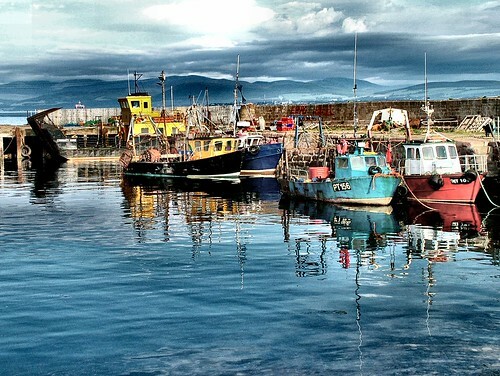 Inverness is now a thousand times bigger than Cromarty....."
Cromarty Harbour, originally uploaded by ccgd. Photoshopped obviously, but I like the effect. 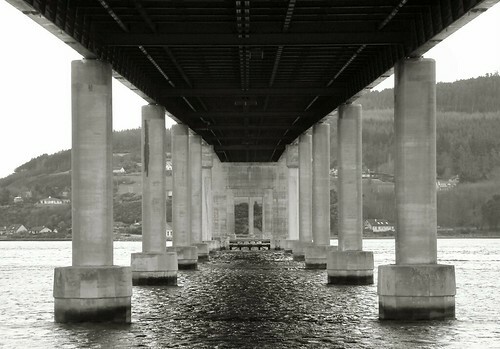 Under the Kessock Bridge, originally uploaded by ccgd. Linking the Black Isle to to Inverness. I have a long association with this bridge - not least because I have commuted over it for the past 21 years living in Cromarty, but in the late summer of 1969, I commuted from across the Kessock Ferry (Crown School in Inverness from North Kessock) watching a small survey barge drill test bores for the engineers who would design and build these very same concrete piles in the summer of 1979. I then spend the summer of 1979 commuting the other way across the Kessock Ferry (in an Austin Allegro) to undertake Farm survey work for DAFS, spending my lunchtimes in the Cromarty Arms, and watching both platforms being built at Nigg, and the Kessock Bridge slowly growing out the mud of the Inverness Firth. The peedie lass in the Harr B&W, originally uploaded by ccgd. The peedie lass in the Harr, originally uploaded by ccgd. 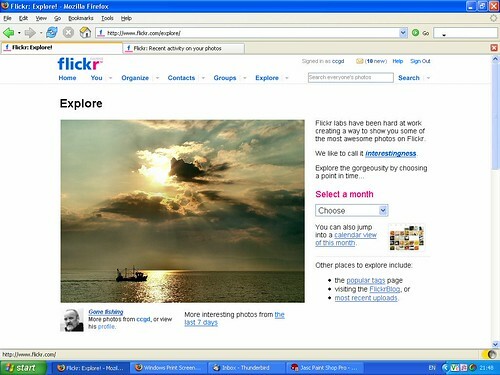 Explore Front Page, originally uploaded by ccgd. Gone fishing, originally uploaded by ccgd. The strap-line of this photo is "Prawns and monkfish for the tables of Paris and Madrid from the Highlands and Islands of Scotland." I took it last night on a walk along the beach. It was a funny night, with mist and harr, and I'd been trying to get a decent shot of the Peddie Lass and the huge crane barge sitting at Nigg.
" Yes, this is the perfect shot....."
And it is - over a 1000 views on Flickr in 24 hours - and its on the front page of the worlds most popular photo-sharing site. Getting photographed, originally uploaded by ccgd. The winners of this years ICT Youth Challenge - the team from Fortrose Academy, whose managing director just happens to be our Hamish, getting photographed for the official press release. 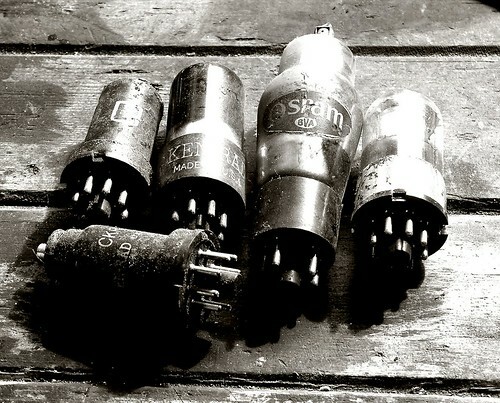 Old radio valves, originally uploaded by ccgd. Radio Valves from the 40's on my workbench. I almost never throw anything out, and as a result my shed is a hell hole. I'm going to have to be brave, and have a Stalinistic purge on junk. But not these valves. They have an intrinsic beauty of their own. 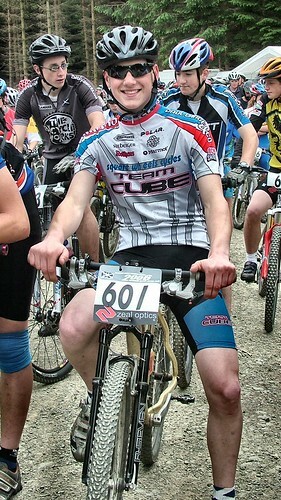 Team Cube, originally uploaded by ccgd. Scottish Mountain Bike Cross Country Championships at Glentress last weekend. Magnus rides 601. He had a good start - in fact a great start, but had mechnanical troubles and dropped back to 10th at the end of Lap 1. However he managed to climb back up the field to get the bronze medal, missing silver by a second. He managed to win the silver medal at the Scottish Road Championships the previous weekend, and is representing Scotland at Youth level in both the UK Road and Mountain Bike Championships this summer. 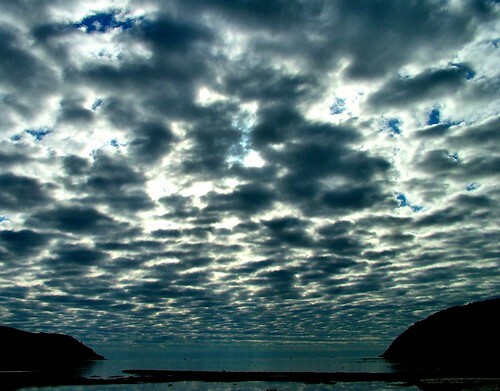 Sutor morning - stillness and clouds, originally uploaded by ccgd. 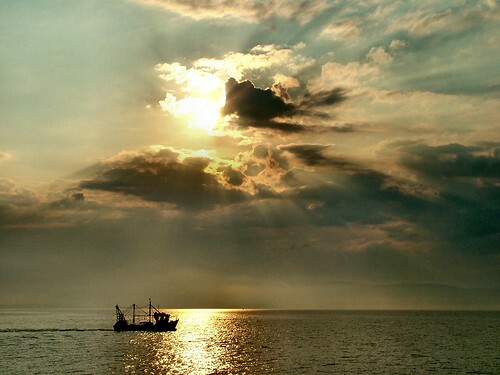 Where does the sea stop and the sky start? 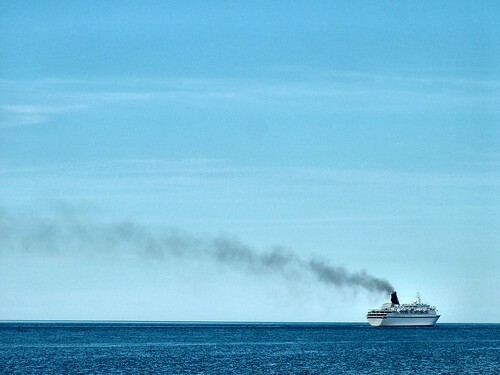 Sea Sky and Smoke, originally uploaded by ccgd.